It seems weird to write about the garden when it is sleeting outside right now. Yes it is actually sleeting. I just drove home in it after having dinner at my brother’s place. This time of year in the midwest can be depressing because we have been teased with 70 and even 80 degree weather only to be slapped with sleet, snow and 40 degree temperatures this weekend. Hmpf. I suppose I should be glad to have those few warm days instead of being pummeled with snow and cold every single day like we were about 8 weeks ago. Anywho on to happier topics like the garden. I already shared my garden plan a couple of months ago. Despite my good planning intentions, we did not start our seeds on schedule. We actually started the peppers 3 weeks late and the tomatoes 1 week late when we planted everything on March 12th. Oh well! Life happens. I’m sure they’ll still turn out fine. This year instead of using my regular recycled seed containers, Benzo really wanted to try a pellet greenhouse kit. FIL has had really good luck with them in the past. 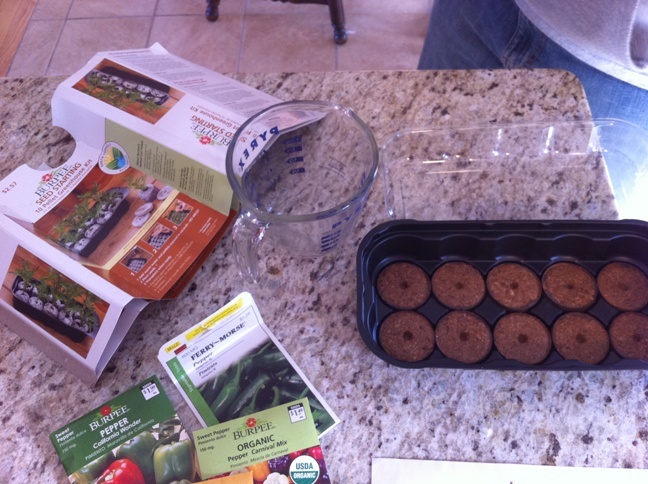 So we stopped by Home Depot one night and picked up two Burpee 10 pellet greenhouse kits. They were very inexpensive at only $2.57 each. We liked these kits because they are long and skinny so hopefully we can find a place to keep them in the house. That has been one issue with seed starting this year is where to keep the seedlings. Because where we kept them last year is now the nursery and we don’t really have any other good warm spots away from the cats. One thing that Benzo did do is draw a map of the tray and label it so we knew what seeds are in what spot. He stuck a toothpick in one of them and then marked it on the map so that we can remember how the map matches up to the tray. This was very beneficial when seeds started to germinate because now we know what they are. Both Roma tomatoes (those are the tall ones), both basils (the two in the front left tray) and the oregano (the one with like 25 sprouts in it). The peppers are going to poke up any day now. I can see them breaking out of their seed shells just below the surface. When the lids were on the trays we kept them on the kitchen table. Now that the lids are off we are keeping them on top of the toaster oven which is close to one of the under-cabinet lights in the kitchen. So far the cats haven’t found them up there and here’s hoping they don’t. So we’re off to a decent start. We still haven’t done anything in the actual garden yet. And it’s not going to happen this weekend with the weather. Maybe in the next couple of weeks. We might get one more pellet tray and start a whole tray of marigolds. Marigolds are good in the garden because they repel pests. 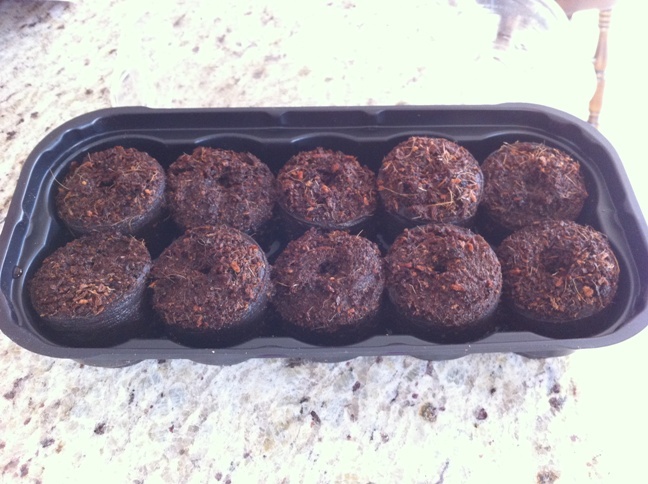 And it would be cheaper to buy a tray and plant the seeds for $2.57 than to buy 10 marigold seedlings. Plus my marigolds always do better if I grow them from seeds rather than transplants. I came across your blog through WordPress’s Gardening feed. What a great blog you have! Good luck with the seed starting. I’ve used Burpee products with success (even though I know some gardeners who don’t like the pellets) for a couple of years. I really love their Ultimate Growing system. It’s expensive, but worth it in my opinion. And it’s reusable. 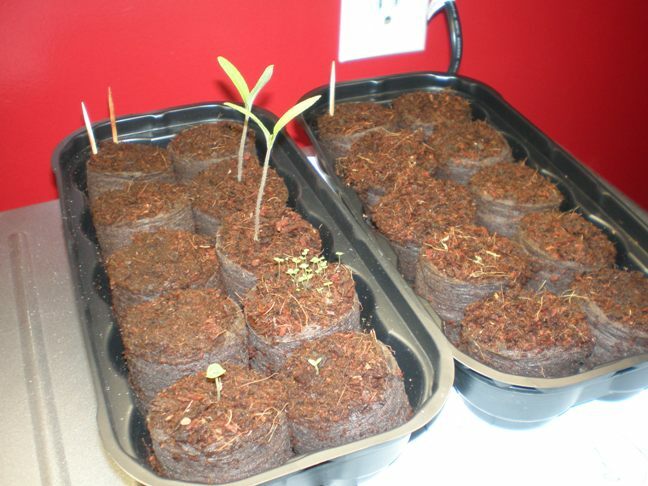 I have some how-tos on seed starting in my blog if you’d like to take a look. I always get eager to chase away the winter blues and start my seeds too early, so right now they’re taking over.